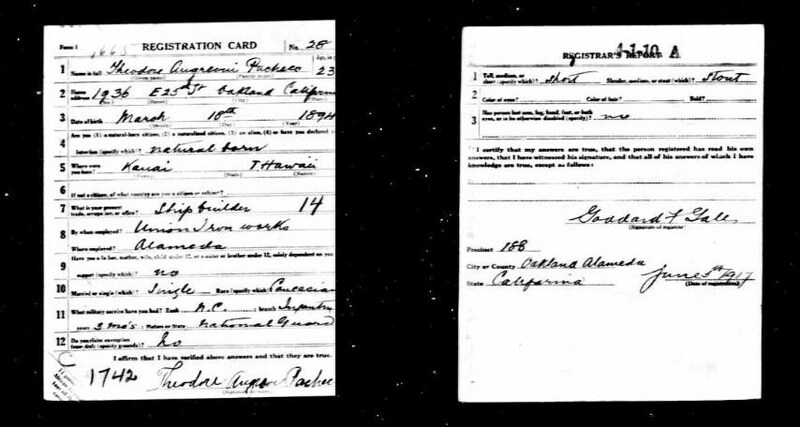 After I found the letter written by Theodore Pacheco in the Garden Island newspaper, I decided to see if there was a World War I draft registration card for him. Sure enough, I found one. I am not sure how I missed it the first time, except for the peculiar middle name. The person who transcribed this record put his name as Theodore Augrevni Pacheco. In the upper signature, I think that is a fair interpretation. But, when I look at the bottom signature, which is in a different hand than the top version, I see Angrove, Angrave, or Augrave/Augrove. I suspect it is Theodore’s version of Algravia. Around 1905, different parts of the Pacheco tree, began changing their surname from Pacheco to Algravia. Later, some used the Algravia as a middle name. But, they were all very unclear on the spelling because I have seen Algarvia, Algarvio, Algrave, Algarva, and Algrava. I’ve probably missed one or two variations. My guess is considering the older generations was illiterate and the younger generation had an average of 3-4 years of education, none of them knew how to spell it. So, each one took a stab at it and put their own spin on the name. Hence, all the variations even amongst siblings. Why did they choose Algravia anyway? I’ve got no clue. My suspicion is the name change came about to cover up the smuggling of my great grandfather, Theodoro Pacheco, to California. He had leprosy and was facing deportation to Molokai. The whole family was involved in his successful smuggling aboard ship. Theodoro took the surname Smith to blend in. Though, when I think about it, what could be more obvious than a Portuguese Immigrant from Hawaii with the surname Smith? Worked for them. They were never detected. I suspect his siblings and children who came to California as well, switch surnames, to throw off the scent of authorities. It was serious business carrying leprosy into the mainland. Theodoro would have been sent back to Hawaii alone. There were no accommodations made for family members when one was deported to Molokai. In some ways, it all seems futile. Almost all the Pacheco’s moved to one street in Oakland, E25th. And, they dominated a portion of that street from 1905 to well into the 1950s. I suspect it was much more difficult for authorities to put their hands on someone once they made it into the country. These immigrant communities did very well at hiding their own problems. Theodoro probably lived in seclusion until his illness became too severe. And, so we have his nephew, Theodore Pacheco, parading around France after the way with a middle name sort of like Algravia, probably never really knowing how to spell the darn thing. I too have been researching my great grandparents Adriano and Rosa Martins who sailed from Sao Miguel to Kauai Hawaii around 1900 with their first child. They immigrated to Oakland, CA in 1908 and lived at 1921 E. 24th St. I have hit a brick wall because I cannot find any record of their arrival in Hawaii only the shipping manifest of when they sailed to San Francisco. Thinking they changed their surname I have searched through thousands of first names in an attempt to find out their true surname but to no avail. Six more children were born in Hawaii and 5 more in Oakland. After the death of their father in 1932 they dropped the “s” off Martins and became Martin. You have given me some new places to search and I hope I can find them that way. On Adriano’s death certificate it states he was born in the Azores and listed his father’s name but no mother. He previously on his military registration had listed his birthplace as Lisboa, Portugual but his oldest son provided the information for his death certificate and I expect that he didn’t have the correct information. So this is my brick wall. Trying to find out their surname and how they arrived in Hawaii. Any other suggestions? Cheri, Are these the same Adriano and Rosa Martins who had a daughter named Olivia (Martins) Pacheco? If so, we are related. I will send you an email. I don’t think I found them in Hawaii either, but maybe I have some information that might be of use to you.